Learning to match related items might seem like a simple skill that all children eventually pick up. However, being able to match items and explain why those items go together is important for cognitive skills and ability. By learning to mix and match related items at an early age, preschoolers will be better prepared for both reading and math in the future. For example, children who master the skills of matching in preschool will be well equipped to match letters to sounds in kindergarten and beyond. This picture matching lesson plan outlines activities to teach preschool students to mix and match things that go together. Name two things that go together. Explain why those two things go together. The teacher can begin by providing an example such as socks go with feet or peanut butter goes with jelly. After the students names some matching pairs, the teacher should then ask the children to explain why the two things go together. For example, the teacher would explain that socks go with feet because socks are clothing made especially for the feet or that peanut butter goes with jelly because some sandwiches are made with peanut butter and jelly. Most preschoolers should be able to name matching pairs of items and also to explain why those items go together. However, if the students have trouble with identifying or discussing things that match, then the teacher should review the concept of related items going together. After the introductory discussion on matching, the teacher should read the book Ketchup on Your Cornflakes? : A Wacky Mix & Match Book by Nick Sharratt aloud to the preschool class. 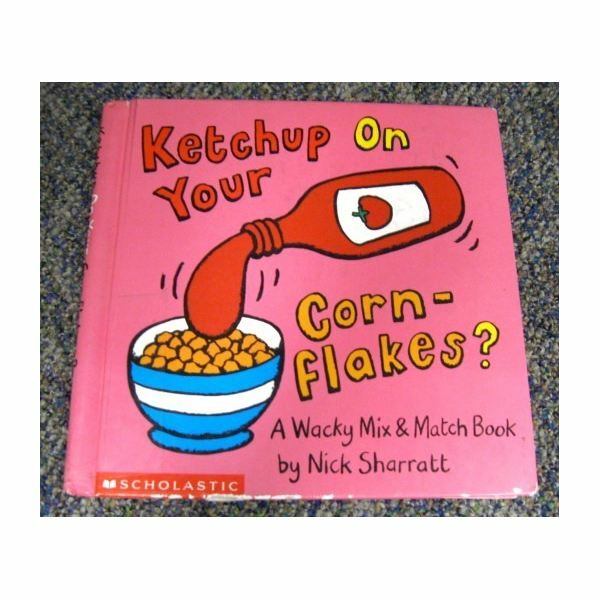 This book, which is recommended for preschoolers in the four to five age range, allows the students to mix and match silly combinations of items by asking, "Do you like ketchup on your cornflakes?" Each page is split in half to allow readers to make unlikely matches such as ice cubes in your bathtub and salt on your toes. With its simple vocabulary and sentences, Ketchup on Your Cornflakes teaches children about mixing and matching through color-coordinated pages that help readers match the correct choices. The preschoolers will love mismatching the words to make silly combinations as well! The Picture Matching activity helps preschoolers practice matching related items correctly. The children will learn to match things that go together and explain why those things go together. The only materials needed for this preschool activity are mix and match cards. Some printable sample cards are available for download at Picture Matching Games: Ketchup on Your Cornflakes Picture Cards. Print or make enough cards for each child to have his or her own set. To play the Picture Matching game, the teacher should give each student a set of mix and match cards. The students can then work individually or in small groups to correctly match related cards. For example, the preschoolers should be able to match the ice cubes card with the ginger ale card. While the children are working on matching the cards, the teacher should walk around the classroom and periodically ask individual students or groups why they are matching certain cards with other cards. For example, the children should be able to tell the teacher that they matched the milk card with the cornflakes card because milk goes with cereal. Once all of the preschool students have correctly matched the cards, the teacher should review which card goes with which other card and why. The children can then take their mix and match card sets home. The teacher can also make additional card sets for the children to play with later. After reading the book and playing the Picture Matching game, the teacher can provide various foods for a mix and match snack time. To continue with the Ketchup on Your Cornflakes theme, the teacher can offer the students foods like ketchup, cereal, ice cream, pie, jelly, and toast for the preschoolers to match or even mix. For example, one student may want to eat just toast with jelly while another student may bravely try pie with ketchup. While the children are eating, the teacher should ask about which foods taste good together and why as well as which foods taste bad together and why. Remember to always check with parents for allergies and other dietary restrictions before feeding any food to the students! Name two things that match. Why do those two things match? The preschoolers should be able to correctly answer all three questions after reading the book Ketchup on Your Cornflakes? : A Wacky Mix & Match Book by Nick Sharratt, playing the Picture Matching activity, and eating mixed and matched snacks. By learning about matching at an early age, preschool students will be better prepared for learning reading and math skills in elementary school and beyond.